These Home Sweet Home Easter Bunny Cupcakes are a cute & easy treat idea for Easter! Basically just your favorite chocolate cupcake recipe baked (you’ll find my favorite chocolate cupcake recipe here), put a gummy bunny inside each once they’ve cooled, top with green icing and the free printable Home Sweet Home cupcake toppers. 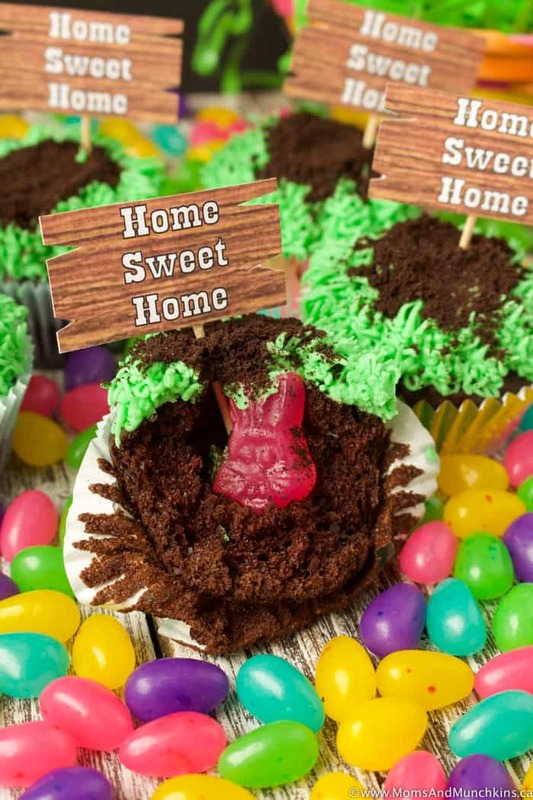 You want the cupcakes to look like a little patch of grass with a brown patch of dirt (chocolate icing or crushed chocolate cookies) and when guests bite into the cupcakes, they’ll find the gummy bunny hiding inside his “home”. Super easy to make and a hit with kids of all ages! I started with my favorite chocolate cupcake and buttercream recipes. You’ll want the cupcakes to cool completely before putting in the gummy bunnies and icing the cupcakes. For the green icing “grass”, I used a Wilton 233 tip for this. You’ll want the icing thick enough that it holds that grass shape. First Step (after cupcakes have cooled): Use a large round icing tip to dig a little hole out of the middle, drop in a gummy bunny, put the cupcake hole back on top and then use the green icing for grass. Put a little bit of crushed chocolate cookies in the middle of the grass to look like dirt then insert the Home Sweet Home cupcake toppers. Now when someone bites into the cupcake they’ll find the adorable bunny! It’s such a fun idea for an Easter cupcake. 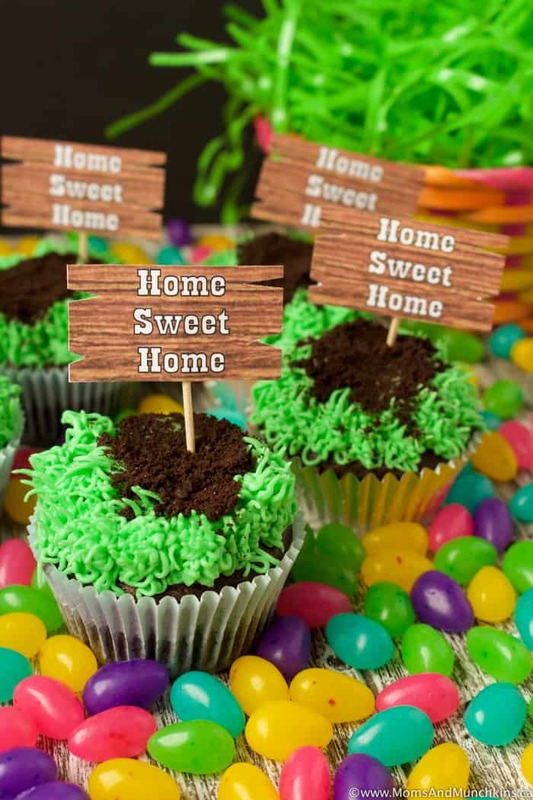 You can print the free Home Sweet Home cupcake toppers here. For more Easter ideas like recipes, free printables, activities and more, visit our Easter page. Stay updated on the latest ideas by following us on Instagram, Twitter, Facebook and Pinterest. Those bunny cupcakes are beyond cute. What a clever idea to hide the bunny right inside! I hate the icing sugar mess that comes with cake decorating so I look forward to giving Cremin a try. No matter how careful I am, I always end up with white powder all over my kitchen!